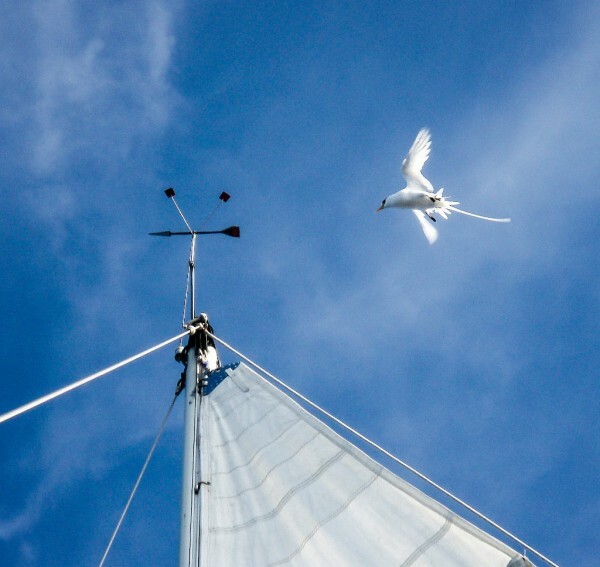 Word is getting out among sailors worldwide to help report back on the birds they see at sea — and they are spotting some unusual birds, from the Caribbean to the Indian Ocean to the Arctic’s Northwest Passage. Tropicbirds are commonly reported to the Birding Aboard project, perhaps because they are so elegant and have a habit of circling the mast. Photo Ellen Massey Leonard. The “SeaBC” is a citizen science project coordinated by long-distance birdwatching sailors from around the world at www.birdingaboard.org. Sailors taking part in the Odyssey sailing rallies are encouraged to join in the SeaBC project. 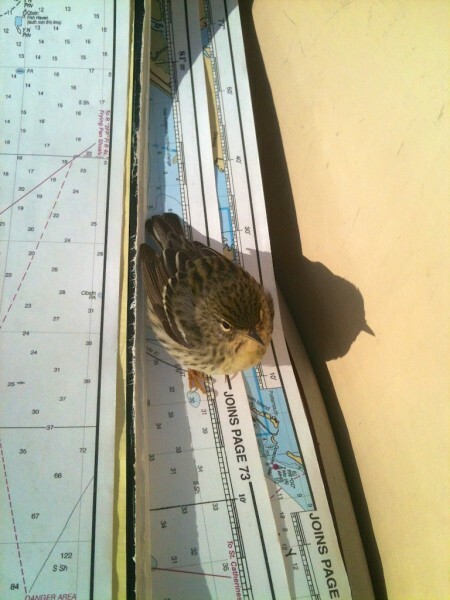 A tiny Blackpoll Warbler, a migrant between Canada and South America, rests in the cockpit of s/v Cinderella about 20 miles oﬀ the Florida coast. Photo Jaye Lunsford. Reports are contributed to Cornell University’s eBird database (www.ebird.org), so their sightings become a resource for scientists and conservationists worldwide. 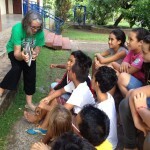 Participation is designed to be simple for non-birders juggling navigation and boat-handling. They are simply asked to photograph any birds seen at least two miles from shore, followed by a snapshot of their navigation display’s coordinates if their camera is not geo-tagged. Taking a quick photo of the boat’s position is an easy way to record where you have seen the bird. 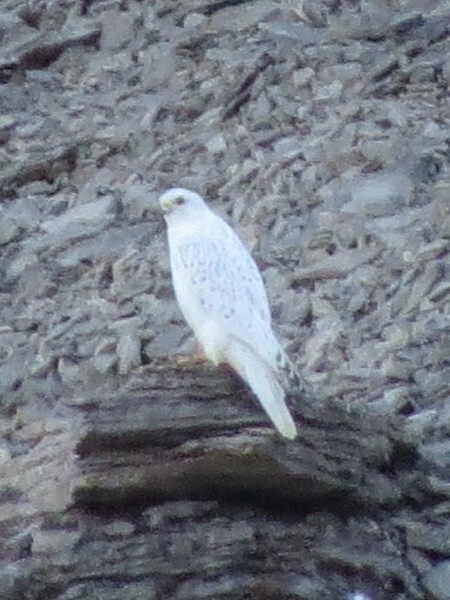 Sailing vessel s/v Aventura IV, sailing with the Blue Planet Odyssey through the Northwest Passage, photographed a rare white morph Gyrfalcon cliff-nesting on an island in the Canadian Arctic Archipelago in Nunavut. Their sighting adds to a lone 1999 historical eBird report of a Gyrfalcon at the same location. 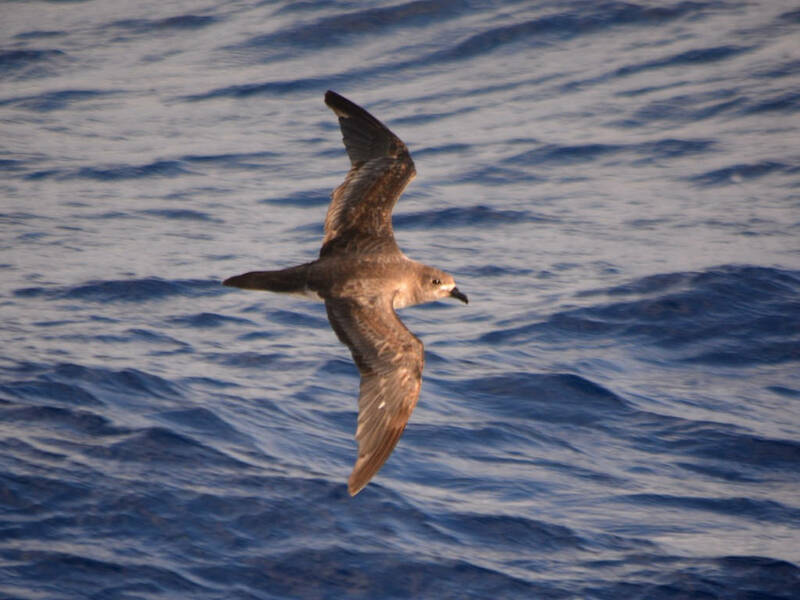 A striking capture of a fast flying ocean bird, a Trindade Petrel at home a thousand miles from shore. Photo Michael Sammer. 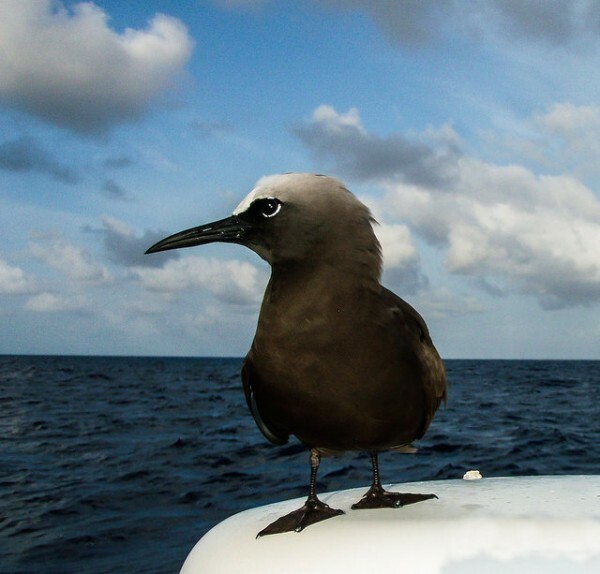 Two homeschooled children, ages 10 and 11, logged all the birds they saw during their two-week transatlantic voyage, scoring a Red-billed Tropic bird and Masked Booby closer to Cape Verdes than their expected stronghold in the Caribbean. In that same fleet, s/v Gemm and s/v Fleur de Sel documented flocks of Cattle Egrets in the middle of the Atlantic Ocean, over a thousand miles from Africa or South America. The Cattle Egret has had one of the most wide-reaching and rapid expansions from its native range in Africa, spreading northward through South and North America since first sighted in Guiana in 1877. They are presumed to have flown across the Atlantic Ocean, given that immature Cattle Egrets will disperse up to 3,100 miles from their breeding area. 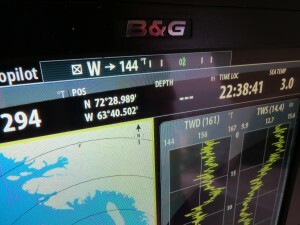 So Lanzarote to Martinique (the Atlantic Odyssey’s passage) is just a jump across the pond! Although the majority of SeaBC reports are not flagged as eBird rarities, the regular sightings hold equal value. Because sailors pass by inaccessible island nesting sites, many reports have notably high counts of common species. Reports of tropic birds, boobies, noddies, gulls, terns, auks, puffins, fulmars — along with photographs of difficult-to-identify shearwaters and albatrosses — make up the bulk of the Birding Aboard project. These include reports such as Black-footed Albatrosses off the Alaska coast, summer breeding flocks of Dovekies in Arctic waters, Iceland Gulls in winter off New England, migrating Phalaropes off Newfoundland, Yellow-nosed Albatross off South Africa, Cory’s Shearwater off Morocco, and Fea’s Petrel off Cape Verdes. All these reports help fill in distribution and abundance data in under-birded areas. 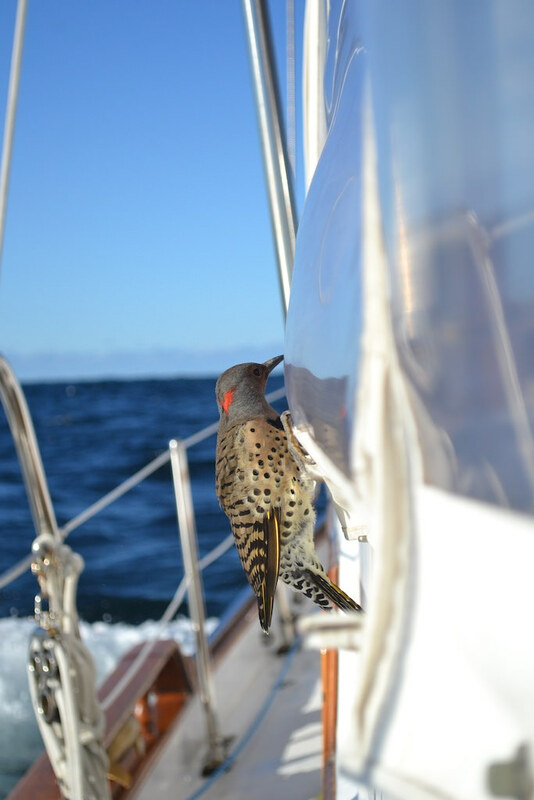 Woodpeckers at sea, for the second season in a row, Northern Flicker reported 20 to 60 miles oﬀ the mid-Atlantic coast of the U.S. Photo LeAnn Marchman. 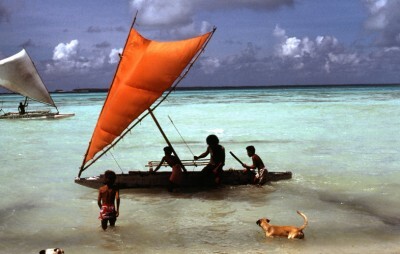 The SeaBC is a Clean Wake Project of the Seven Seas Cruising Association, an Environmental Programme of the Ocean Cruising Club, and a part of the Sail the Odyssey Environmental Program.